If you visited the Arboretum over the summer, you probably noticed that our waterway was especially thick — thicker than normal — with common aquatic weeds like water fern and duckweed. To help manage this overgrowth, we hired a company in August that specializes in large-scale aquatic weed removal. 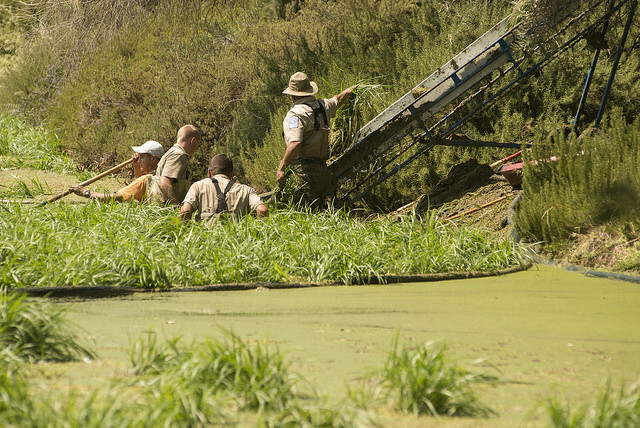 The contractors used what they call a “floating weed boom” to lasso large portions of aquatic weeds into a controlled area. They then gradually pull the boom tighter and tighter while shoveling the corralled weeds up onto a conveyor belt that removes the plants from the water. To date, this team has worked to clean up major portions of the waterway including the large pond areas by Putah Creek Lodge and Spafford Lake. These weeds are a natural symptom of nutrient-rich pond habitats and will continue their vigorous growth until we create a better functioning system. Although this will be an ongoing issue in the short-term, the good news is that we have an overall design to introduce flow into the waterway and create a better functioning system over the long-term. In addition, we have funding for phase one of that design from the east end of the waterway to just west of the T. Elliot Weier Redwood Grove. Keep an eye out for more in the coming months and years.